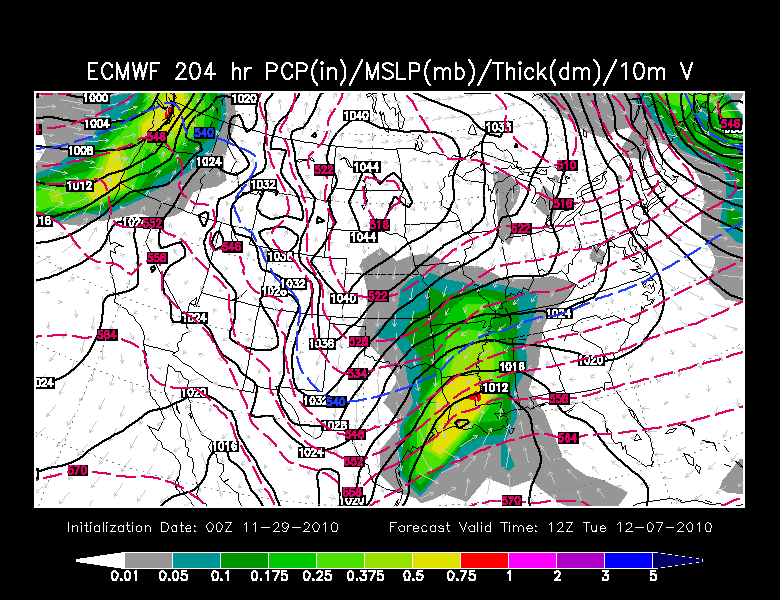 I am still intrigued by the storm possibilities for Tuesday, December 7. Here is a quick look at last night's 0z run of the European forecast agency's weather computer model. The Euro takes the surface low much further south through Texas and along the Gulf Coast. It spreads rain over the top of colder air (aka a running-over event). This could be snow and ice for someone. With this specific run, ice would most likely be south of the KFVS viewing area and we would pick-up a little bit of snow (a couple of inches). 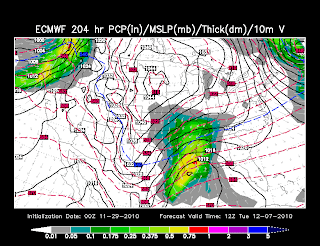 This makes two runs in a row of the Euro taking the storm further south and the KFVS viewing area being on the far northern edge. Could it be on to something? We are still talking about a storm that a) is 204 hours away from reality and b) hasn't even developed yet so there is great uncertainty. The morning run of the NWS Global Forecast model is still being processed and isn't out yet. I'll check on it a little later today and will post it's findings later. Disclaimer: This is not my nor the Heartland StormTeam's forecast. This is just a look at what computer models are showing at a given point in the future. The following information is not mean to be definitive. This is merely for discussion purposes only.